The online Bachelor of Dementia Care (BDemCare) has attracted a non-traditional student cohort with many who are mature age, from linguistically diverse backgrounds, geographically isolated, working fulltime, and whose previous schooling finished at Year 10. Foundation units in the BDemCare provide an introduction to studying at university and aim to equip students with knowledge of requirements for academic writing. However, the translation of this knowledge into first-year level study has been difficult for some students, who find academic writing challenging. Of concern was that students struggled to maintain academic integrity, with initial assessments in first year units showing an unacceptably high plagiarism rate of nearly 60%. It was recognised that the response to the plagiarism issue needed to be prompt and tailored to the unique characteristics of the student cohort. 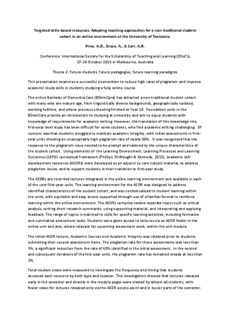 Using elements of the Learning Environment, Learning Processes and Learning Outcomes (LEPO) conceptual framework (Phillips, McNaught & Kennedy, 2012), academic skill development resources (ASDRs) were developed as an adjunct to core subject material, to address plagiarism issues, and to support students in their transition to first-year study. The ASDRs are recorded lectures integrated in the online learning environment and available in each of the core first-year units. The learning environment for the ASDR was designed to address identified characteristics of the student cohort, and was contextualised to student learning within the units, with equitable and easy access supported through use of a familiar format to reinforce learning within the online environment. The ASDRs comprise twelve separate topics such as critical analysis, writing short research summaries, using supporting material, and interpreting and applying feedback. The range of topics is matched to skills for specific learning activities, including formative and summative assessment tasks. Students were given access to lectures via an ASDR folder in the online unit and also, where relevant for upcoming assessment work, within the unit module. The initial ASDR lecture, Academic Sources and Academic Integrity was released prior to students submitting their second assessment items. The plagiarism rate for these assessments was less than 3%, a significant reduction from the rate of 60% identified in the initial assessment. In the second and subsequent iterations of the first year units, the plagiarism rate has remained steady at less than 3%. Total student views were measured to investigate the frequency and timing that students accessed each resource by both type and location. This investigation showed that lectures released early in the semester and directly in the module pages were viewed by almost all students, with fewer views for lectures released only via the ASDR access-point and in busier parts of the semester. The ASDR intervention adapted teaching practices to meet the learning needs of students in accordance with their unique learner characteristics. Using digital technology, the ASDRs provide an effective approach to help support the transition of non-traditional students to university study.